« Sue says it only takes two weeks to become a professional travel writer. I must be doing it wrong. No turtles were harmed during the filming of this epic kayaking movie. The Banff Mountain Film Festival World Tour, which presents absolutely amazing global adventures, has nothing compared to what you are about to see. And, by “nothing compared” I mean that my well crafted, beautifully illustrated, and carefully choreographed offerings are nothing if incomparable to anything professionally published, or even from “somebody sitting on their bed who weighs 400 pounds,” ostensibly in his mother’s basement. 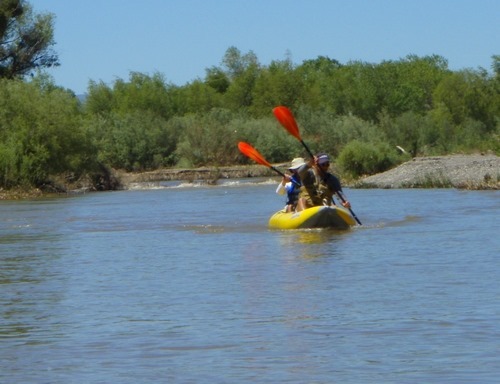 My long history of floating various rivers, creeks, and lakes dates back decades, going back to when I was a twitchy tyke sitting in the bathtub among the bobbing rubber duckies and self-generated bubbling water. Sorry, daguerreotype photographic records were not located dating that far back. As has been documented over years of my posts, my inspirations include the aforementioned Banff films, decades of Outside Magazine, and my major man-crush, the storied author Tim Cahill. Thanks to a number of current and ex-commercial river guide friends, my family has enjoyed many memorable river trips, including lottery luck of a permit on the Main Fork of the Salmon River. 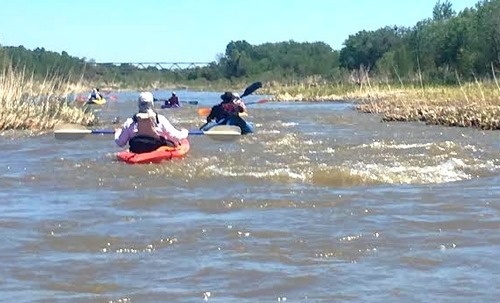 Now that I have aged past the point I am willing to be packing my own poop down the river in the infamous “groover,” I have paid to participate in commercial trips, which are, cost-wise, well worth their weight in the aforesaid human detritus. 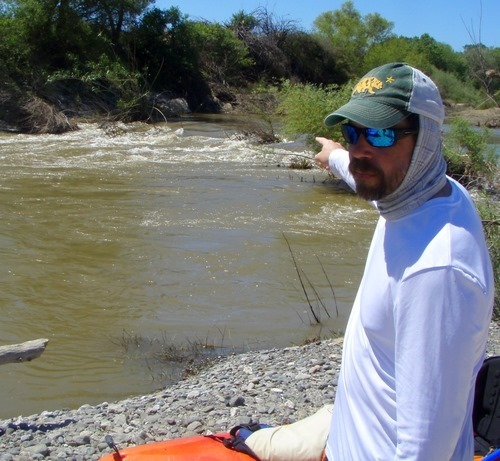 The common factor in these river treks, whether self-guided or commercial, is often the long distances to drive to get there, plus the appurtenant trip logistics. The details can be staggering on the self-guided floats, which includes packing enough of your choice of adult beverages/recreational pharmaceuticals to guarantee adequate evening staggering. Then there are the considerable expenses, esp. if you expect someone else to cook your food, schlep you gear, set up your tent, plus handle those other doo-doo duties. 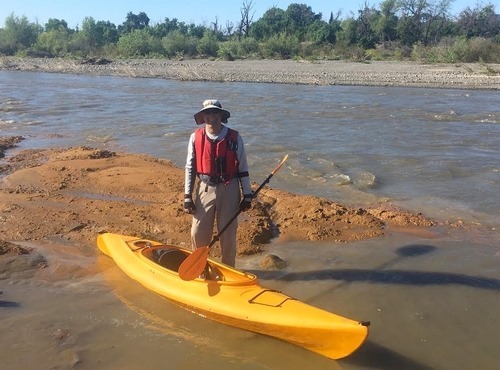 Thanks to a colossal dumpage of rain and snow this winter, the opportunity—like the water level in the oft-dry creek, literally in my backyard—arose to sufficient flows to kayak last weekend. I joined a small group to navigate what nature offered us. Logistics first; let’s see, how many beers per river mile will that take? 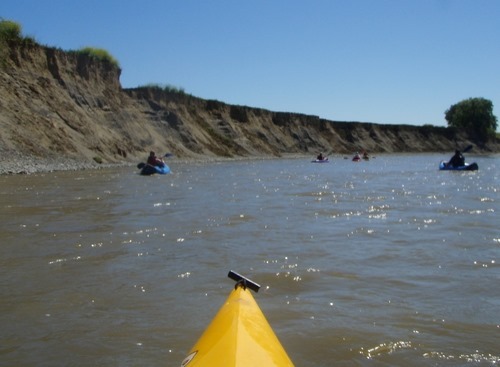 Seven of us floated down the lower Cache Creek in a flotilla of sit-in, sit-on-top, and inflatable kayaks for a memorable day of sun, moving water, and surprisingly scenic setting for an agricultural valley. That does not mean we spent the whole day in a pancake-flat setting. While not quite the Grand Canyon, there was plenty of variety of topography to view. For those interested in the specifics, the flow above our put-in (which was the Yolo County Capay Open Space Park) was 100+ cfs (cubic feet per second), and roughly 500 cfs below our take-out (at the Cache Creek Conservancy). 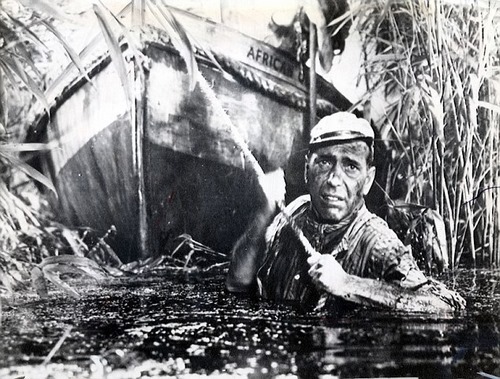 There were a few shallow riffles that required “attention,” meaning jumping out of your watercraft for a bit of African Queen action. 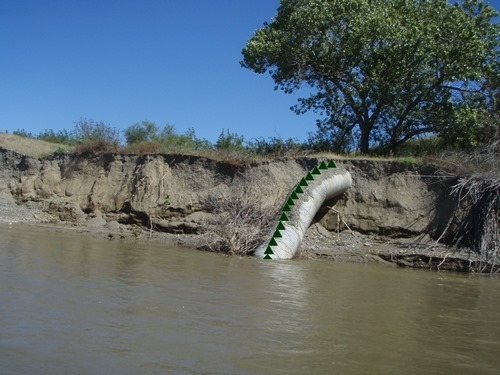 There is an inflatable dam (no, really) above the county park, which makes river floats problematic, typically, after May 1st, given the ag use of the river water. You can check the flows by clicking on “latest,” on the links I provided above, or by going to the NOAA predictive site for each gauging station. Almost all of the lower Cache Creek that is above the high water mark is on private land. The county park is open to the public, and you can park at the Conservancy, but make sure to check their hours. 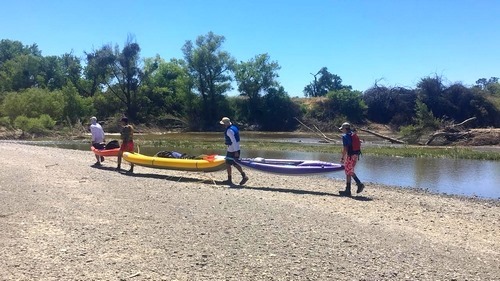 At the Conservancy you cannot drive to the water’s edge, so will have to carry your boat, maybe a couple hundred+ yards, so make sure you finish those cases of beer before you get there. 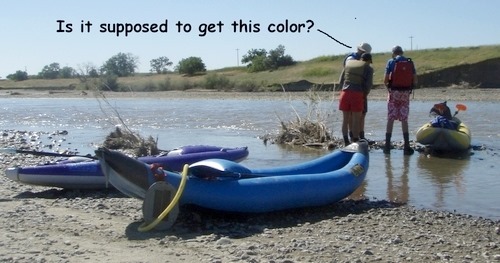 Unless you wish to become a candidate for the next Darwin Awards, wearing a life jacket is de rigueur. Beyond that, what you wear or pack along is a matter of personal preference. As you can see, I tend to go big when it comes to covering up. On the other hand, our lone female team member was wearing a bikini part of the time. I would have posted her picture, too, but her husband was along, and he has the stature of an NFL linebacker. We had only one “portage,” meaning we wished to avoid becoming one with a massive beaver dam, which simply required that we walk the boats about 100’ along the shoreline. We were blessed to see multiple soaring hawks, great blue herons, ma and pa mallards, a bashful river otter, and jumping fish. Also, I got a glimpse of an elusive creature that was “documented” in the movie Tremors, which apparently no one witnessed other than me. 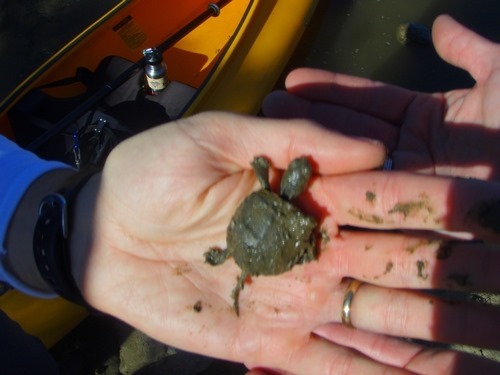 Our first wildlife sighting showed up before we even put in on the creek when this little guy crawled by my kayak. Worry not; he (she?) was not being one-sided. Her (his?) right appendages were just tucked under its belly. While I would not drink the water directly from this creek, I really don’t know of too many deleterious effects that might be picked up on your person by exposure to a creek flowing through a heavily farmed area. Funny thing is, they weren’t looking at the turtle at the time.